30 gb Zune Model 1091. Won't connect with my new pc and I am done trying and have no real use for it. Includes docking station, cables and remote. Was lightly used years ago, but cleared to factory reset. 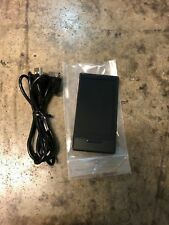 Microsoft Zune HD Black (16 GB) Digital Media Player w/ Wall Charger and 2 USB to Zune Charging Port cables Very good condition, no cracks or scuffs. Charges and operates as it should. Hardly any signs of wear. It powers on and and says need firmware updated. It is possible to update it through various sites on Microsoft and other die hard zune support fan sites. This player will have to have firmware updated in order to be functional. Sold as is. Local pick up is available. We will do all that is in our power to accommodate your needs. Model- 1395. Reset- Factory reset and ready for new user. Storage- 16GB. Used - Factory Reset & Working. 2 Zune Car Lighter Adapters (for playing Zune in car through FM radio signal) with Zune rubber mat. 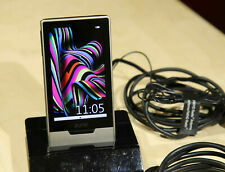 -Zune Dock with Remote. -Zune Car Lighter Power Adapter. -Zune Wired Remote. Microsoft zune 30gb with 3,939 songs. Condition is Used light scratches on the screen but nothing major. Shipped with USPS priority mail. Microsoft Zune HD Black (16 GB) Digital Media Player. Condition is New. Shipped with USPS First Class Package. 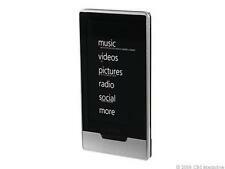 Microsoft Zune HD Black (16 GB) Digital Media Player with Docking Station and 32. Condition is Used. Shipped with USPS First Class Package. Also includes 32gb model that's beat up pretty bad but works was going to make 1 good one out of 2 but lost interest. Microsoft Zune 120 Black (120 GB) Digital Media Player. Condition is Used. Shipped with USPS Priority Mail Flat Rate Envelope. This Zune has not been used besides powering on when originally purchased and there are no flaws on the surface. The zune comes with the bottom compartment of the original box and the booklets shown in the pictures. Accessories not included. Brown Zume In Good Condition. Thanks for looking. Up for sale is a brown colored Microsoft Zune. I think it is a 30gb version. Included is a Radio adapter that plugs into the bottom as well as a charging cable. I will also include a USB wall charger to charge the zune (it’s an Apple brand charger, however works fine). The battery still holds a good charge. eBay defaults to US priority mail, however if you prefer a different method let me know. Feel free to send me any questions. With Soft Jacket, and USB Cable. zune 30gb brown mp3. Condition is Used. Model- 1125. Storage- 8GB. Reset- Factory reset and ready for new user. No other accessories are included in this sale. Unless noted or pictured power cords and/or adapters are not included. Used - Factory Reset & Working. 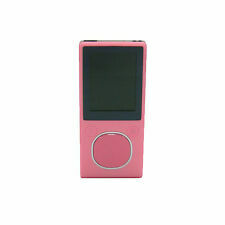 Zune - 4 Gb Video Mp3 Player (Black). Microsoft Zune 80GB Black model 1126, with charging dock wireless remote.works. Microsoft Zune 30GB Red, Working, Up to Date Player Only. Condition is Used. Local pickup only. Explore new music or rediscover old favorites--then sync them to your Zune. Extend your subscription online or by purchasing a Zune Pass card. Discover, share, and connect with the Zune Social, a free online community that lets you share your musical tastes with friends and millions others. Microsoft Zune 80gb color black, excellent condition fully updated and connects to zune software! has a new battery and comes with a charging cord, will be shipped asap, thanks for looking! MICROSOFT ZUNE HALO 3 EDITION BLACK. HARD DRIVE.NEW BATTERY.A NICe ONE. WE STRIVE FOR FIVE. You are buying a special Halo Edition of the Microsoft Zune MP3 player. Microsoft Zune 80 Joy Division Limited Edition Black ( 80 GB ) Digital Media Pl…. Condition is Used. Shipped with UPS Ground. Trending at $117.50eBay determines this price through a machine learned model of the product's sale prices within the last 90 days. It has a few light scratches but looks good. It functions fully and perfectly. Model- 1395. Storage- 16GB. Reset- Factory reset and ready for new user. Used - Factory Reset & Working. No other accessories are included in this sale. Unless noted or pictured power cords and/or adapters are not included.